NAPA, Calif. (CelebrityAccess) CelebrityAccess has just returned from BottleRock in Napa, Calif., after three days of music, food and wine and here’s a blog-tastic account of the artist performances, a few interviews, and an unnecessary digression into donuts. 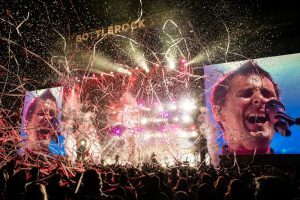 BottleRock was built off the sweat equity of three people at promotion company Latitude 38 and has been an industry leader for the recent trend of combining the VIP / culinary experience with live music, with this year’s headliners Muse, The Killers, and Bruno Mars. The focus on special stages, VIP areas and suites with prices up to $3,500 has given the festival the pejorative nickname “White-chella” (aka the “Fancy Coachella” as Bruno Mars put it) but it was sold out and absolutely packed at a 30,000-cap per day. The business model works. A few things were different this year, the first one since Live Nation acquired a majority stake in the company. Namely, grass. The site of the festival, Napa Valley Expo, was the landing ground for firefighters and their massive equipment last fall during the area’s devastating firestorm, destroying the grounds. Rather than attempting to regrow grass throughout the property, BottleRock rolled out acres of artificial turf that not only looked nice and was easy to walk on but probably made for an easy late-night clean up. Also new, at least so it seemed to this visitor, was more focus on up-and-coming acts. It had its share of Shakey Graves’s, Michael Frantis, Allen Stones, along with mainstage acts likes Earth, Wind & Fire and Thievery Corporation, but also more of the relatively less-known like Hundred Handed, David Luning, The Alive, The Record Company, and Ethan Tucker. Plus, of course Caitlyn Smith. But of the breakout artists, BottleRock’s most prescient bookings were probably for Tank & The Bangas, The Struts, Lake Street Dive, and The Aces, at least out of the acts seen. Tank & The Bangas won last year’s Tiny Desk Concert competition at NPR and is fronted by slam poet Tarriona “Tank” Ball. Google “force of nature” and you’ll see several different media outlets using that term to describe Tank. Seriously, give it a shot. It’s a band that must be mere months away from exploding to stardom. 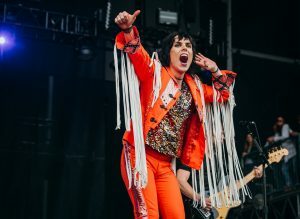 The Struts, meanwhile, fresh off a tour with Foo Fighters, hit BottleRock about the same time they are hitting the upper echelons. Ain’t nobody seems to be as cool as The Struts are right now. They may have had the highlight of day one with a cover of Bruce Springsteen’s “Dancing In The Dark” that was covered by several media outlets (doesn’t hurt they brought on a festivalgoer to reenact Courtney Cox’s ’80s dance). Their popularity was evident later that day when they played an acoustic set at the more intimate JamPad stage – well, intimate in name only. The crowd was one of the largest for that particular stage. Speaking of the JamPad stage, that’s where Magic Giant, which had played the mainstage earlier in the day, showed off its compelling people-rock but skirting the stage entirely and hopping into the crowd, staying there after the performance to take photos with the new fans. Yeah, I know: it’s vertical but how else to get the disco ball into the shot? Some of the other highlights: Snoop Dogg and Warren G were on the culinary stage to achieve a Guinness World Record for the world’s largest cocktail which was, what else? Gin & Juice – about 145 gallons of Hendricks Gin (from the creative/weird vendor booth next door) and a massive amount of orange juice donated by Whole Foods. Celebrity sighting: Shep Gordon, who regularly attends the event not because of his association with celebrity chefs but, rather, because of a friendly association with the founders of Latitude 38 and because he’s on the board of directors. Also, almost the entire festival ground to a halt to watch the end of Game Six of the NBA’s Western Finals between the Houston Rockets and the Golden State Warriors, which was broadcast on many of the screens across the festival. Plus, Billy Idol gathering a crowd that rivaled that of The Killers, playing later that night on the same stage. Another highlight, on the business side, was the inventory of ticket exchange company Lyte. Founder Ant Taylor whispered the numbers in this reporter’s ear and it was staggering. A couple of lowlights: Halsey made it through her mainstage set but then said she was treated backstage for her asthma. Plus, the festival grounds were locked down for an hour Saturday afternoon between 4 p.m and 5 p.m., causing massive entrance lines, after a car chase. Police were pursuing two suspects of armed robbery and one ran into the festival, where he was arrested. 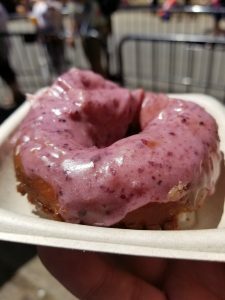 There’s always plenty of good food at BottleRock, mostly from local vendors, but this year it appears the belle of the ball was Johnny Donuts, founded in San Rafael. It seemed that everywhere you’d go, someone would be there with a donut on a plate. In years’ past, one of the more popular items was fried chicken, to the point where the vendor would run out of inventory three hours before close. In this case, the Johnny Donuts food truck became so popular that they ran out of their three-day supplies on Friday, the first night. The line was so long that security put out crowd stanchions, claiming it was a fire hazard, operations manager Sarah McKenzie told CelebrityAccess. The company, founded by Craig Blum in 2012, went from a food truck to a brick & mortar establishment within months. She and Blum said that the donuts, at about $6 a pop with locally sourced ingredients, are more expensive because of the effort put into them (they were recently used in a movie – the donuts were flown down to Los Angeles for the shoot). 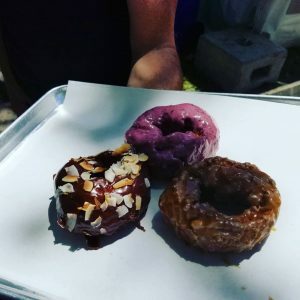 At BottleRock, they created several donuts they had never made before including a devil’s food chocolate cake and an apple chocolate cake donut. “When Garth and I got married almost 13 years ago we made a decision to be together and to not be apart. That’s one of the reasons why when he went on tour we went together. I was in the show for a few songs but we wanted to be together. The festival wrapped with Silent Disco at the Lagunitas Stage, a dual concert by Warren G and White Panda. The event had about the same attendance as last year’s, about 4,000 to 5,000 visitors all wearing headsets. 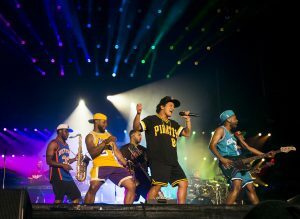 Yes, the festival unofficially wrapped with Bruno Mars around 9:45 p.m, but this event continued until 10 p.m. and could have gone longer, according to one production staffer, because the decibel level was well below the 95 db threshold. 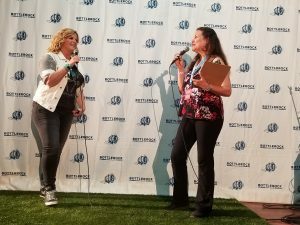 Richman was asked by CelebrityAccess his impressions on the event.